Just courtesy. Don't want your dead body bothering other patrons. First they killed me. Then they stole my corporation. I dead. You no make me clean tabelt. in asia people don`t dine.. they die! "Again, the chinese need to be directed to act like civilized human beings? I thought they invented civilization! Something's serious wrong over there." The Sumerians did. 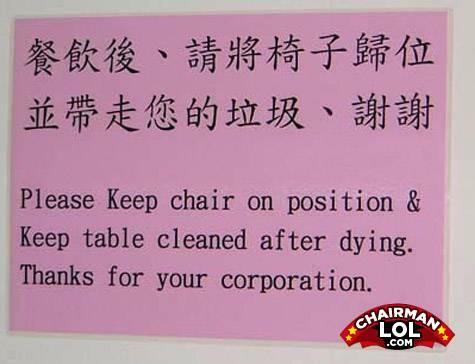 I can't keep table clean after dying..I'll be dead already. "I'd lol'd so hard, . . . can't breathe" well, if you happen to die of suffocation, just make sure you clean up afterwards.